Federico: Thanks for the information. Always enjoy the background stories and information on these knives. John: Yes, that's my knife. One of my favorites. Had been looking at them for a while when this one came up on the auction and I grabbed it. Wakey wakey...new Italian knives post is coming! Today I want to talk you about one model from region Abruzzo. Ever heard about that place? It's a wonderful piece of our boot country with stunning mountain landscapes and a nice costal area. Abruzzo is maybe considered one of the wilderness strongholds in Italy, whith wolves populations, rare birds of prey and a unique brown bear subspecies that just survive in less than 50 specimens. 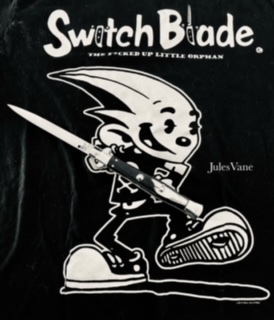 But, let's focus on blades! Abruzzo has a strong tradition in knife making. The iconic knife here is called Gobbo abruzzese that means "Abruzzo's hunchbacked". Why this strange name? It's easy to understand just taking a quick look at the pictures below. The handle in this model is almost straight for two thirds of the length, then suddenly benting down and forming a sort of hump. Some people may think that a handle of this type shouldn't be comfortable, but the Gobbo abruzzese, on the contrary is a masterpiece of ancient ergonomic design. Moreover it has the charateristic to seem small and rounded when closed and to become unexpectedly great when opened. This is a model mostly used by farmers and shepherds in mountain areas. It usually has a slipjoint mechanism and the spring is, in most cases, thick and hard. The knife exists in at least three different versions, according to the place of manufacturing. So we have the Gobbo abruzzese from the village of Loreto Aprutino, maybe the most known version. The Gobbo abruzzese from the village of Guardiagrele, with a wider handle, less slender, often decorated as well as the blade. It's rare now to find one of these, because no one in Guardiagrele goes on in producing knives. And then the so called Coltello marinaro or Coltello da pescatore (Sea knive or Fisherman knife), a version born for working in maritime context, that has an external spring to favourite disassembling and cleaning to prevent rust. This last knife is considered to be part of the family of Gobbo abruzzese knives even if it's an antique hybrid between two models: Gobbo abruzzese and...I can't tell you now! This knive has such an interesting story that it deserves alone a single post. Anyway...from time to time some of these antique knives appear on the banquets of American markets or on American ecommerce and auction websites. That's because they often travelled in the pockets of Italian immigrants from Abruzzo region who landed in America many years ago. I'm struggling against mosquitoes, guys. If I win this battle I'll come back next week! Great stuff. Getting an education about knives that I knew nothing about. They are interesting and apparently very useful to those who employed them in their work. Excellent use of pictures too! Now that you have gotten into the grove, no time to wimp out over a couple of flying insects. Those are beautiful knives with very interesting history. I'm looking forward to your next post. Thank you guys, I'm happy you appreciate these old rusty blades! Good looking knives and great information. Thanks for the look at some of the other areas of knife production in Italy. 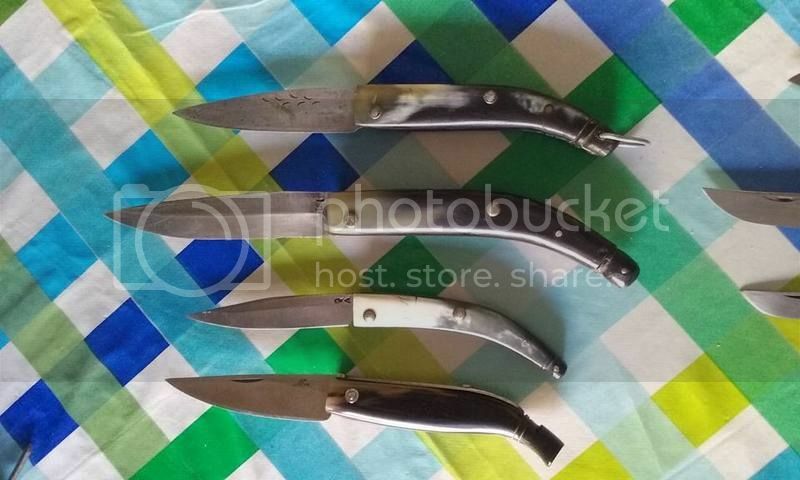 I often see knives like these for sale but dont know their names or purpose. On the fonessa knife there is a blade stamp ....is this usual on italian knives as i have a gardening knife with a similar stamp that i cant identify. 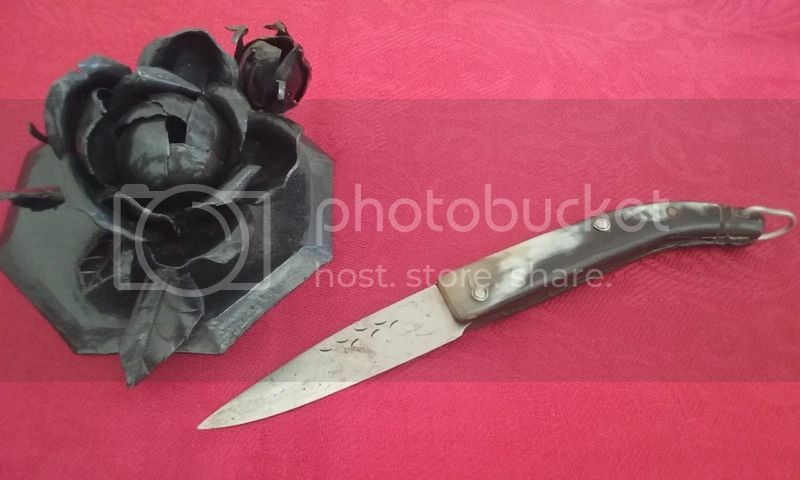 I posted a couple of pictures,unknown fighting knife ,and a horticultural knife with stamp as mentioned. 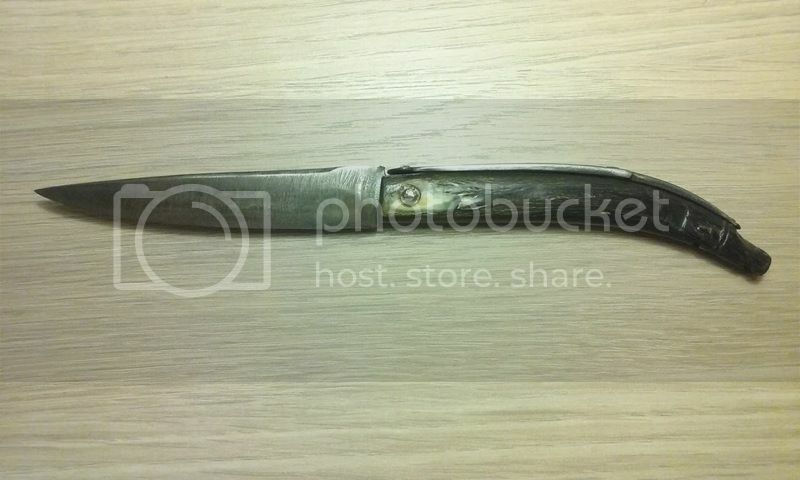 Is this an italian fighting knife and has it a particular name? Thanks for taking the time to explain each one . The firts one is an Italian duel knife from Rome or nearby areas, built in 1800-1900. It's an unusual form. I just saw one with the same shape some months ago on ebay. It's usually called "coltello alla romana" or "serratore alla romana". I will write about this model in one of the next weeks. The second one is a "Roncola, used by farmers. It's present in all the contry with slightly different shapes. Great information, thanks for sharing Frederico! Today I want to tell you about a knife coming from region Piemonte (Piedmont in English). 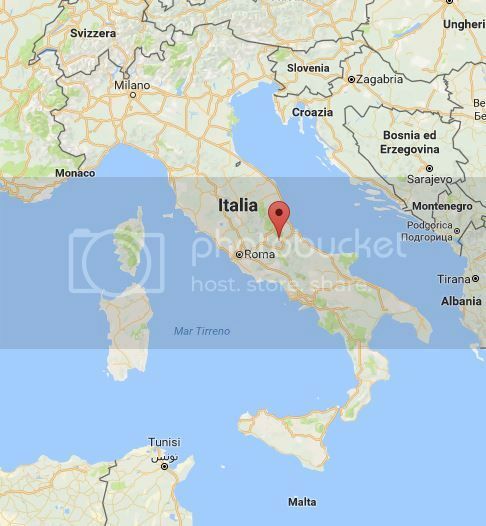 Do you know where Piemonte is? As you can see we are in the northwest part of the "old boot" at the borders with France. And here it is the protagonist of our weekly talk. This knife is generically known as Piemontese (Piedmontese). It has a linear shape, a metal scructure (often brass), horn or bone scales and a big metal bolster. This bolster with its typical form, derived from a fixed blade model, is the distinctive feature that allows you to recognize Piemontese knives on market banquets or online auctions. 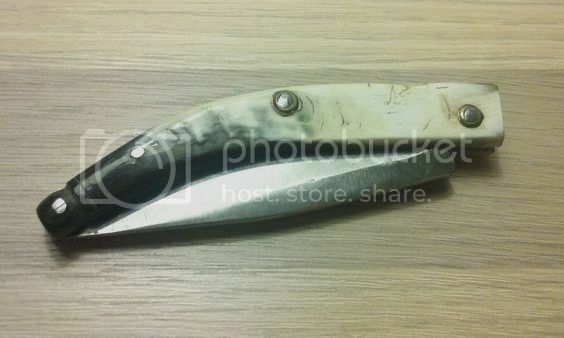 This knife exists in different measures: You can find small samples, with a slipjoint mechanism, in which the blade is sometimes accompanied by a corkscrew, medium allround knives, and big (very big) duel kives, sometimes equipped with a lock back mechanism to fix the blade in open position. These last knives often have elaborate fileworks on the back of the blade and of the blocking system. Piemonte, was one of the Italian regions in which stabbings were relatively frequent as they were one of the ways of clarifying certain situations. In some knives (both small or big ones) the handle sometimes ends with a small metal boot, common characteristic with other Italian and French knives. Even if this knife is usually called Piemontese this is not the only model of this region. There other knives from Piemonte, equally interesting, used in alpine and rural areas. But we will see them in another occasion! See you next week with another knife! 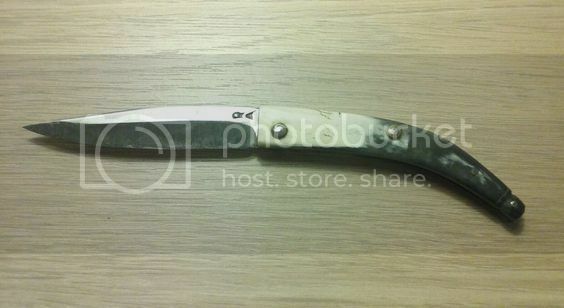 PS: All the pictures in this post are taken from the net, since I actually don't have a knife Piemontese in my collection. Wicked cool knife from the Piemonte region. This knife would make another nice addition to my collection. The Gobo abruzzesi knife immediately reminded me of AGA's new knife the Sahara, go to 3knives.com for photos. The vintage knives you posted are beautiful. Ian, those knives are awesome!